The Largest Tech Company in Every State #Infographic ~ Visualistan '+g+"
In today’s digital age, almost every aspect of business and commerce is effected by technology. In the 21st century, most individual industrialists (e.g., Vanderbilt, Rockefeller, Carnegie) have been replaced by massive corporations and conglomerates, and nearly all are involved in the technology space. 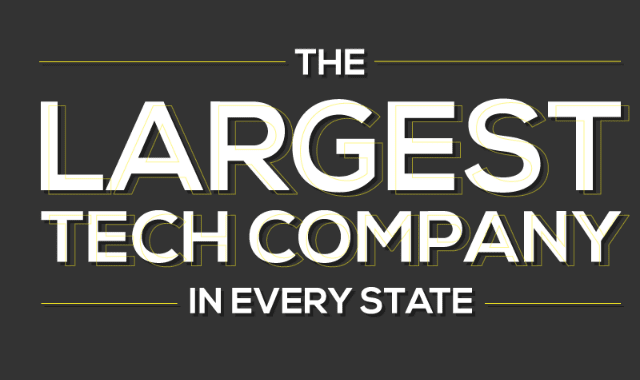 Check out the infographic below to see which tech companies loom largest in the United States. This list of largest tech companies by state is based on the company revenues listed on the 2016 Fortune 1000 list. For lesser-populated states, the Inc 5000 list of fastest growing companies was the source.